Carpet is still the primary flooring choice for many homeowners. After all, it’s relatively inexpensive, comfortable, generally easier to install and replace than other floor coverings, and it offers more options in terms of colour and textures than any other floor covering option on the market. 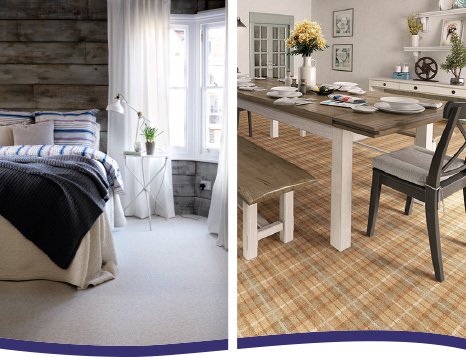 Carpet adds warmth to your home and can feel much more welcoming and cosy. Selecting a good quality carpet from Windsor Carpets has many benefits including, sound proofing, comfort and warmth underfoot, a non slip, safe floor and unlimted designs and textures. Carpet plays an important role in reducing the noise in your home, they absorb sound which helps in upper levels of the home or areas with a floating subfloor. The warm attributes of a carpet help to retain and also increase the warmth in the home, they are natural insulators with a low heat conduction. Carpets are both non slip and soft. The non slip properties reduce the risk of any falls so are ideal for the elderly and infants. In the event of any fall, carpets tend to be soft and cushioning. Carpets have the ability to trap dust in the fibres of the pile until it is vacuumed. The trapped dust holds any germs or allergens that are attracted to it.